Twice a week Momiji operates a Doctor’s Clinic. The clinic is for Momiji tenants who have registered with this doctor as a patient. Please note that in urgent circumstances, any Momiji tenant can be seen by this doctor. 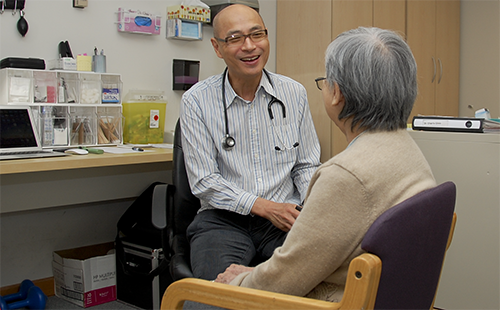 To book a doctor appointment, contact Support Services Manager at 416.261.6683 x 228. On Tuesdays and Thursdays, Momiji conducts Fall Prevention and Seated Strengthening Exercise classes to help seniors strengthen their muscles, improve their balance and coordination, and ultimately prevent falls. These classes are open to Momiji tenants and community seniors. All participants are assessed to determine their level of need and placed into the appropriate class. For more information and to register for this service contact the SALC at 416.261.6683 x 248. Momiji arranges for a foot care nurse from an outside agency to visit Momiji on a regular basis to provide tenants and community seniors toe nail cutting services. There is a fee for this service. For more information or to register for this service contact Case Coordinator at 416.261.6683 x 223.
education on common diseases, prevention and healthy living. These services are not covered by OHIP or any other government funds. Therefore Momiji incurs the expense and there is only a fee for medical supplies provided. For more information about nursing services contact Support Services Manager at 416.261.6683 x 228. Momiji offers a physiotherapy clinic every Wednesday and Friday afternoon. 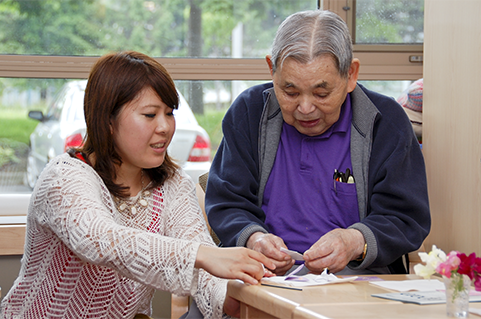 Momiji tenants and community seniors can participate in either group or individual sessions with a registered physiotherapist and certified assistant. There is a fee for this service. For more information or to register for this service contact Case Coordinator at 416.261.6683 x 223.